Last week I received a beautiful hamper from Genius. 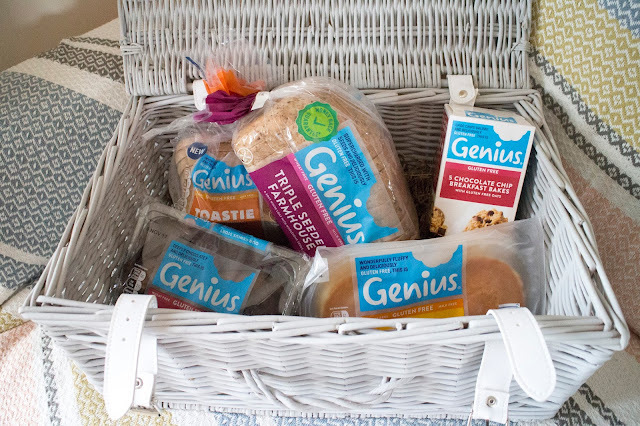 Genius was one of the first brands I recall trying when going gluten free, 5 years later they are still a firm favourite in my bread bin! I was overwhelmed when I got home to find that it was in an actual hamper! I am totally going to re-purpose this for my wedding! So what did I get inside? These are a Genius idea, see what I did there! Retailing at £1.75 these are perfect for someone like me who is the only gluten free eater in the family, they're equally as great if you like to have a variety of flavours. As they are not too over priced in comparison to a full loaf, they are a great option. It is milk free too! One of my all time favourite loaves, this bread isn't too seedy to the point where the bottom of the bag is full, but there is just enough to give it flavour. I find that this is lovely toasted with yeast extract, or even toasted with garlic fry light to make it like a garlic bread! Much like the Toastie, it is milk free too! These milk and gluten free pancakes are perfectly fluffy and suit a pile of raspberries and a good drizzle of honey! These biscuits are perfect with a cuppa on a cold morning! The softer bake is lovely and filling for the morning as they are oaty, thick and so tasty. I find these great on a weekday when rushing around or even as a snack! I would like to note, these are not milk free! Muffins are a true love in my life, whether as a snack or with a ton of raspberries or banana for breakfast. Muffins are a great filling indulgent treat, much like most of the range these are also milk free so a great chocolatey treat for the dairy free people in your life too! I'm so excited to tuck into these and potentially make some new recipes from them!